An easy to maintain hairstyle. You will have an easy time maintaining any haircut on this list. To adopt a stylish hairstyle. Women are judged based on the hairstyle they choose. Go through the list below if you desire a stylish look. Goddess curly hairstyle is characterized by both a blonde and curly hairstyle. Here, you have the freedom of choosing the size of curls to adopt on your head. Form a layered look throughout the head if you desire a unique and spectacular look. Consequently, the layered look makes it easy to form curls throughout the head. Goddess curly hairstyle also emphasizes that a large fraction of your front view hair rests on the left side of the head. You will have an easy time maintaining this hairstyle as it rests within the hair line. As the name suggests, you should plait your hair at some point on the back of the head. Enhance the texture of your hair through blow dry. In addition to this, traces of blonde color should be visible at some point on your black hair. Sleek all your hair towards the back of the head before forming a long braid. 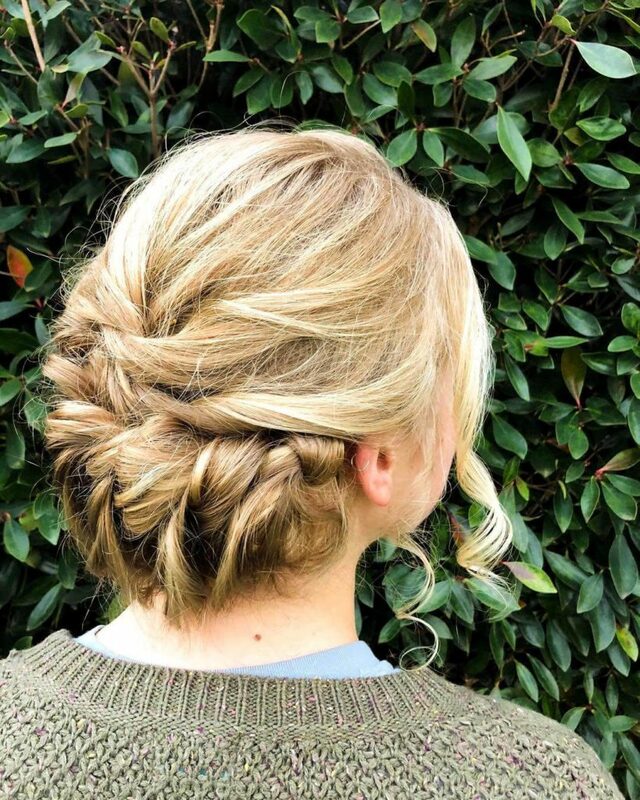 This braid should stretch from your mid head hair to some point on the back of the head. Give some section of your sideways hair curls before combing it straight. Updo ballerina hairstyle suits women with thin hair. Black color is recommended when designing this hairstyle. Form both a layered and wavy look on your head before commencing the designing process. Conjoin all your hair at some point on your mid head and clip them together using a headband. Updo ballerina hairstyle suits women who desire a temporary hairstyle that gives their hair enough breathing space. That’s not all; this glamorous hairstyle perfectly blends with any outfit you choose. The layered look makes the entire maintaining process easy. Choose this hairstyle if you desire a messy look on your head. Adopt both a layered and curly-wavy look if you desire a messy look within a short period. Traces of highlight color should be visible on your black hair. Conjoin all your hair on your mid head before forming a bun. Here, you are free to choose the size of bun to form on your head. Afterwards, unevenly sleek hair on your bun to attain the messy look. Choose this hairstyle as you will have an easy time adopting another look. Here, your hair should attain a blend of two dull colors, mostly black and highlight. Wispy edges haircut suits women who desire curls throughout the head. Form both a layered and curly-wavy look before designing this hairstyle. This glamorous hairstyle gives you the freedom of choosing the size of curls to form on your head. Above all, you have a lot of designing options. Rest your fringe hair on your forehead and should conjoin with hair on both sides of the head. Lastly, this hairstyle only suits casual events. This marvelous hairstyle deserves a spot on this list. 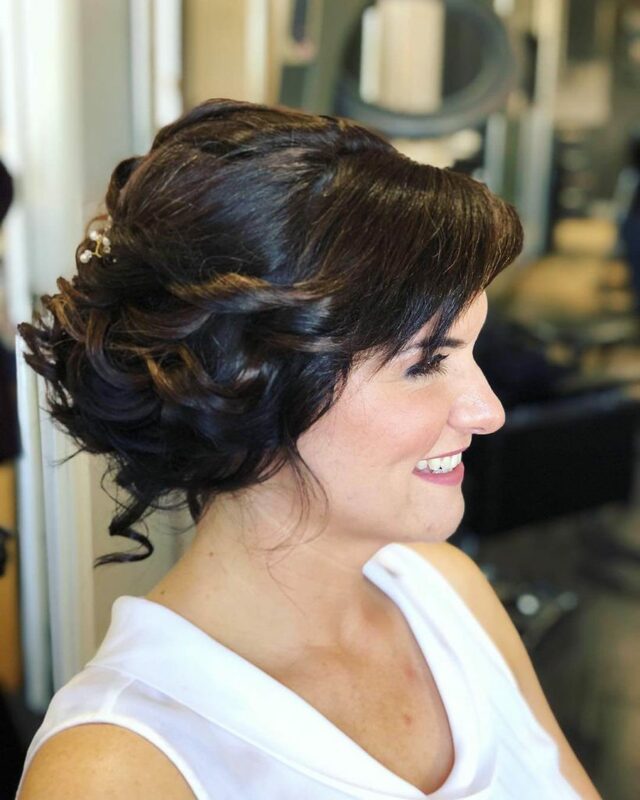 Choose an experienced stylist if you desire to look good on this hairstyle. Coiled wavy hairstyle focuses on giving you a wavy look on your head. A section of your front view hair should rest on both sides of the head and the rest on the back of the head. Give your entire hair curls before combing your hair towards its respective direction. Conjoin a section of hair on the back of the head and form a loose bun. Lastly, any outfit perfectly blends with this hairstyle. As the name suggests, hair on the left side of the head should be plaited. Go ahead and give a section of your hair a blonde look. Majority of your hair should be black in color. Give all your hair a curly-wavy look before sleeking all your hair towards the back of the head. Carry on and plait hair on the left side of the head. Conjoin your braid with hair on the back of the head and form a low bun at some point on the back of the head. You will definitely outshine everyone with this marvelous hairstyle. Tendril hairstyle with low bun is attributed by a curly-wavy look throughout the head. Enhance the looks of this hairstyle by adopting a layered look. Additionally, this hairstyle presents you a lot of designing options. Tendril hairstyle with low bun gives you the freedom of choosing the size of curly-wavy look on your head. Conjoin all your hair at some point on the back of the head and form a low bun. Lastly, this hairstyle is characterized by a blend of black and blonde color. Enhance the looks and texture of your hair through blow dry and adopting a layered look. Consequently, traces of black hair should be visible on your head. Go ahead and form a curly-wavy look throughout the head. Afterwards, sleek all your hair toward the back of the head. This gives you an easy time maintaining your hair. You will also have an easy time adopting another hairstyle. Mysterious sunset hairstyle suits women looking for a temporary hairstyle that gives their hair enough breathing space. Do you desire a simple yet magnificent hairstyle? If yes, check out tight voluptuous curly hairstyle. Here, you can use any dark color when designing this hairstyle. Proceed and form a curly look throughout the head. A layered look makes it easy to form curls within a short period. Sleek a section of your front view hair on both sides of the head and the rest straight towards the back of the head. Intertwine hair on the back of the head so that it remains within the hair line. Tight voluptuous curly hairstyle blends with any outfit you wear. Here, attention lies on both sides of the head. A large fraction of your hair should attain a blonde color and the rest a black look. Form a curvy look before sleeking all your hair straight on the back of the head. The layered and curvy look makes it easy to adopt a messy look. Conjoin all your hair at the back of the head and form a loose bun. Airy and volumized hairstyle gives your hair enough breathing space. This marvelous hairstyle suits women looking for a simple yet stylish temporary hairstyle. As the name suggests, this curly updo hairstyle focuses on giving you a natural look. Natural pompadour hairstyle is attributed by a black look throughout the head. Go on and form both a layered and curly-wavy look before commencing the designing process. Conjoin all your hair at some point on your mid head. Use your hair or hair band to clip your hair together. Afterwards, enhance the looks of natural pompadour hairstyle by using colorful jewelries throughout the head. Consequently, enhance the looks and texture of your hair through blow dry. Start off by giving your entire hair a black look. Sleek your front view hair straight on either the right or left side of the head. Conjoin the rest of your hair at the back of the head. Go ahead and give your entire hair a layered look. Shiny bowl haircut with wispy ends gives you the freedom of choosing the size of curls to form on your head. Feel free to form a loose bun on the back of the head. You will definitely have an easy time maintaining this curly updo hairstyle. Curly twisted pin-up hairstyle is one of the latest hairstyles on this list. It is characterized by both a black and curly look throughout the head. Women with thin hair are the perfect candidates for this hairstyle. Use gel to enhance the looks of your hair after forming curls on your head. Here, you are free to choose the size of curls to use when designing this hairstyle. Sleek all your hair upwards and should conjoin on your mid head. Afterwards, sleek your hair towards different directions, depending on your needs. Choose an experienced stylist if you desire a glamorous look on this casual hairstyle. 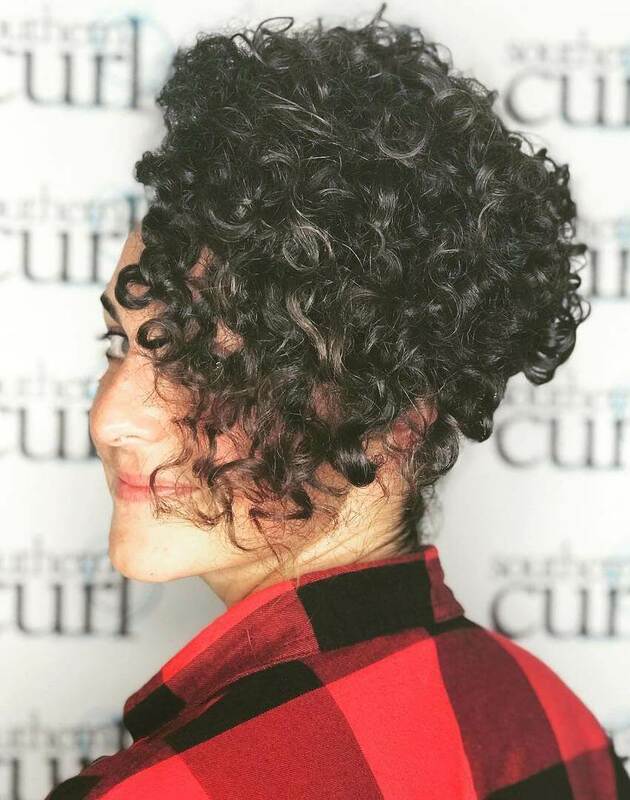 Systematically form both a layered and curly-wavy look throughout the head. Additionally, traces of blonde color should be visible on you head. The color blend and the curly-wavy look automatically make casual roll back hairstyle suitable for only social events. Proceed and sleek all your hair straight towards the back of the head. Ensure all your hair remains within your hair line. Women who choose this hairstyle have an easy time adopting another hairstyle. It also makes them stand out from their peers. Curly jumbo bun hairstyle is characterized by a blonde look throughout the head. Carry on and blow dry your entire head. This enhances the looks and texture of your hair. Go ahead and conjoin all your hair at some point on the back of the head. This is the point your form a curly look while forming a bun. You are not limited on the size of bun to form at the back of the head. A layered look is recommended for this hairstyle as it differentiates curly jumbo bun hairstyle from other hairstyles. Here, attention lies on the left side of the head. 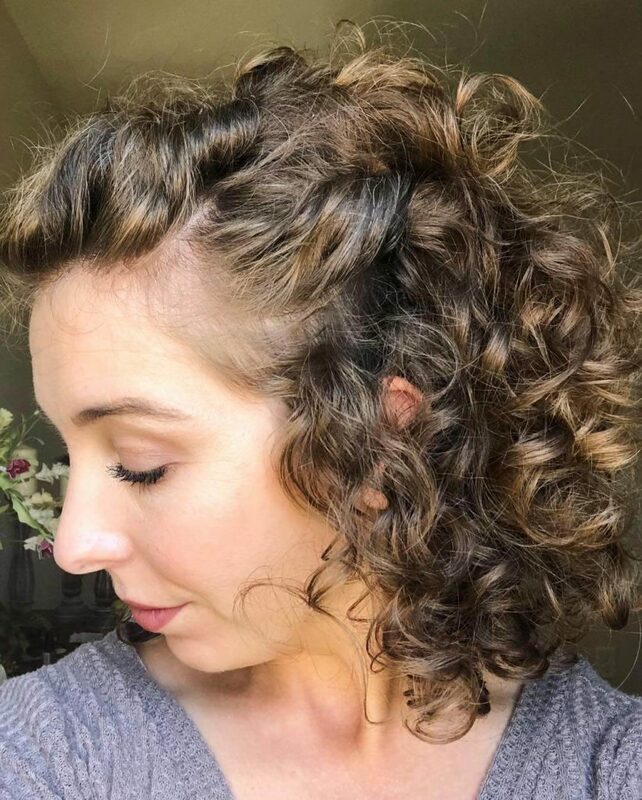 Form a curly look throughout the head. This applies to your front view hair and hair on the back of the head. Sleek a large fraction of your front view hair on the left side of the head. Hair on the right side of the head should rest behind your right ear. Choose one sided pinned up hairstyle as it perfectly blends with any outfit you wear. In addition to this, this hairstyle guarantees you uniqueness as few women choose this hairstyle. Accessorized hair with bun suits women looking for both temporary and permanent hairstyle. Blonde and black color is recommended for this hairstyle. Carry on and adopt both a layered and curly-wavy look throughout the head. Conjoin all your hair on the back of the head and form a bun. This marvelous hairstyle can be customized for both official and casual functions. Consequently, you will have an easy time adopting another hairstyle. Consider accessorized hair with bun if you desire to give your hair enough room for growth. As the name suggests, this curly updo hairstyle focuses on giving your hair front ponytail. Therefore, you should have at least medium length hairstyle to be eligible for this hairstyle. Form a curly-wavy look before conjoining all your hair on your mid head. Afterwards, sleek a section of your hair straight towards your forehead. Systematically place hair on your forehead to attain a uniform look. That’s not all; curly front ponytail hairstyle offers you a lot of designing options. This is one reason you should consider this spectacular hairstyle. Here, attention lies on your mid head and the left side of the head. Use both black and highlight colors when designing this hairstyle. Form both a layered and curly-wavy look on your head before commencing the designing process. Conjoin all your hair on your mid head and hold it together with a head band. Move on and sleek a section of your hair straight on the left side of the head. Side swept curls hairstyle suits only social functions. Lastly, this hairstyle perfectly blends with any outfit you choose. You will outshine anyone around you with this amazing hairstyle. Asymmetric wavy hairstyle gives you the freedom of choosing the size of curls to adopt on your head. Design a layered look if you desire a wavy look within a short period. Carry on and form a blonde look on your black hair. Sleek a section of your front view hair on both sides of the head and the rest straight on the back of the head. The color blend on your head makes it suitable for only casual events. Half updo haircut is attributed by a black look throughout the head. Updo haircut focuses on giving you a ponytail on the back of the head. Form a layered look before commencing the designing process. A section of your front view hair should rest on either the right or left side of the head. Sleek the remaining hair straight towards the back of the head. Go on and form a curly-wavy look throughout the head. Half updo haircut suits women who desire an urban casual hairstyle. Slightly curved urban hairstyle deserves a spot on this list. Go ahead and give your entire hair a curly-wavy look. Sleek all your hair straight towards the back of the head apart from a section of your front view hair. A section of your front view hair should rest on either the right or left side of the head, depending on their position. Feel free to form a low bun at some point on the back of the head. Slightly curved urban hairstyle suits only social events. Check it out. A large section of your hair should attain a black look and the rest a blonde look. Enhance the looks of your hair through blow dry and adopting a layered look. Consequently, the layered look makes it easy to form curls on your head. Proceed and comb all your hair straight towards the back of the head. Conjoin all your hair on the back of the head and form a low bun. Luscious hairstyle with curled bun gives you the opportunity to showcase your pretty hair. This is one of the few natural hairstyles on this list. Simple layered hairstyle focuses on giving you both a blend and layered look throughout the head. Sleek a section of your hair on the both sides of the head and the rest straight towards the back of the head. Form a low bun of your own size on the back of the head. This simple layered hairstyle is easy to maintain and perfectly blends with any outfit you wear. Lastly, this is a pure casual hairstyle. 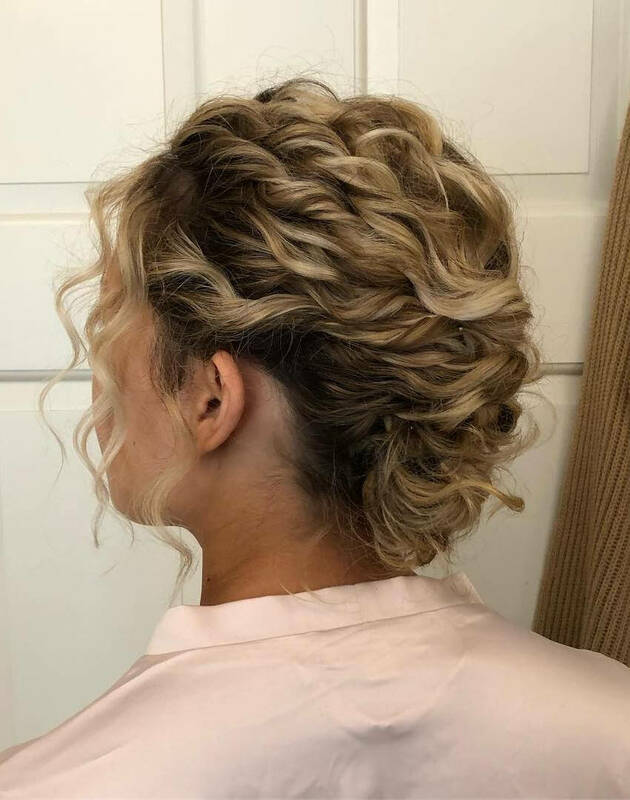 Check out this curly updo hairstyle.